Long curly-wavy hair always looks exhuberant and happy and Mariah has caught the look perfectly with this fabulous hair design! It’s difficult to know which is more appealing, the profusion of wavy hair flowing loose around her shoulders or the beautifully applied golden balayage! This style is cut into long layers keeping the top fairly flat, but with lots of wavy width around the sides and lower lengths. The trendy centre-parting divides to frame the face with shorter, wavy tresses that accentuate the eyes, mouth and chin with lovely golden reflections. The expert mix of beautifully harmonised gold shades uses the latest balayage technique to add natural-looking colour accents, creating even more depth and texture to these gorgeous, rippling waves! 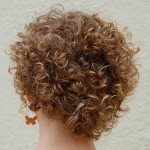 Find more trendy hair styles on Hairstyles Weekly.